This content has been archived and may be out of date.Guys, This week we are going to address the grading, membership, and uniforms! Grades are finalised Grades are finalised and the draw is published through to week 13, week 14s draw will be published on the weekend following week 13. Week 15 and 16 are finals, but teams missing out on finals will will play in friendly matches so if your team misses finals your season is not over. 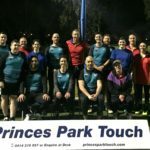 Membership As players in our comp you are members of Princes Park Touch Association. Every player should have read the members section of the website that explains this and also the responsibilities of team and players. Uniforms The members sections FAQ addresses unforims. Teams should be in uniform. If they are not they may be penalised tries by the referee. Any questions?